In Brief: Hike forested hills, valleys, and ridges in Changping District, finishing near one of the Ming Tombs that is still closed to the general public. Views of the Ming Tombs area from a high point in the mountains. 4–5 hours start to finish over 13km. 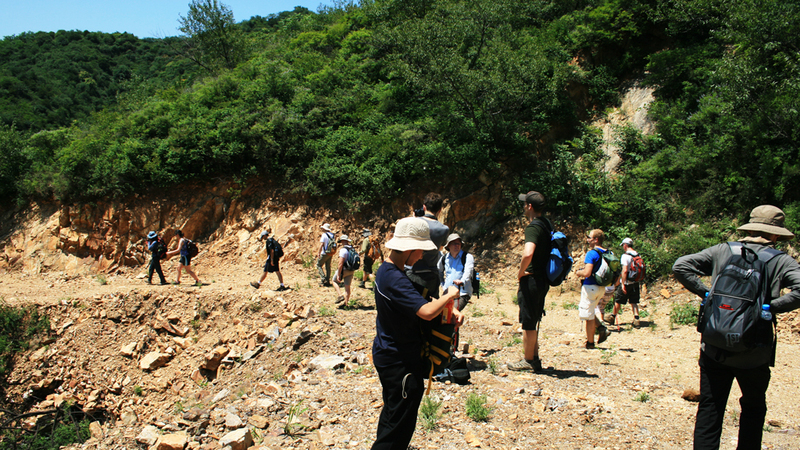 On this 13km hike we’ll join sections of two good Changping trails by visiting what remains of two valley villages that were abandoned as a quarry expanded. We start out at Longevity Village, the midpoint of our Silver Pagodas hike. We’re not heading for the pagodas, though. Instead, we’re going to head off on our Mines and Pines trail, one of our old favourites. After walking through the chestnut orchards that surround Longevity Village, we start climbing up into the hills, following a narrow trail up and over several ridges and through the hills to the west of the Silver Pagodas. We’ll be able to see the mountain behind the Silver Pagodas, and may hear the giant bell ringing. The trail that leads down towards the mines is not commonly walked, and gets very bushy during summer. We’ll start to see pine trees, and will soon start down a winding dirt trail, passing closed-off mine passages and the piles of mine tailings from previous digs. The trail flattens out, and turns into a gravel road that joins the main road through the village below the Silver Pagoda park. Before we get to the road, we’ll take a turn and head back into the hills, following a trail up a valley to a ridge, and then down towards two abandoned villages. Hidden deep at the top of a long valley, the two villages emptied out around the turn of the century. A large quarry at the foot of the valley kept getting bigger, and eventually expanded to cover both sides of the only road up the valley. It’s this quarry that also forced us change the start point of our original Tomb Raiders trail. Walking through the villages, we’ll see the remains of the stone houses. In the right season there are pears and hawthorns to be had, as the old orchards of the villages still bear fruit. Following the trail down, we’ll join up with our old Tomb Raiders trail and head back into the hills before we reach the giant quarry. Joining the old Tomb Raiders trail we will walk up a valley, passing well-built terraces on the way up to a pass. From the pass we follow a trail along the hillside, aiming for a lookout point from where we can get excellent views of the broad valley that contains the thirteen Ming Tombs. From the lookout, we’ll follow a good trail down towards two of the closed Ming Tombs, passing a small dam on the way out. We’ll finish up near a large stelae-carrying tortoise. This sort of tortoise statue is known as a bixi, and is one of the nine “Offspring of the Dragon”. We’ll set up our tables for a little picnic of snacks and cold drinks; when we’re done with those, we’ll head back to Beijing. Route Two: we’ve got two versions of this hike. The start and finish point is the same. The middle section of the trail is different – on this route we go through the mines and quarry area, and then through two abandoned villages. Parts of the trail could be very brushy and overgrown; you might need to duck under branches and leaves. The mines are all closed, but sometimes we meet people working heavy machinery to dig out rocks. 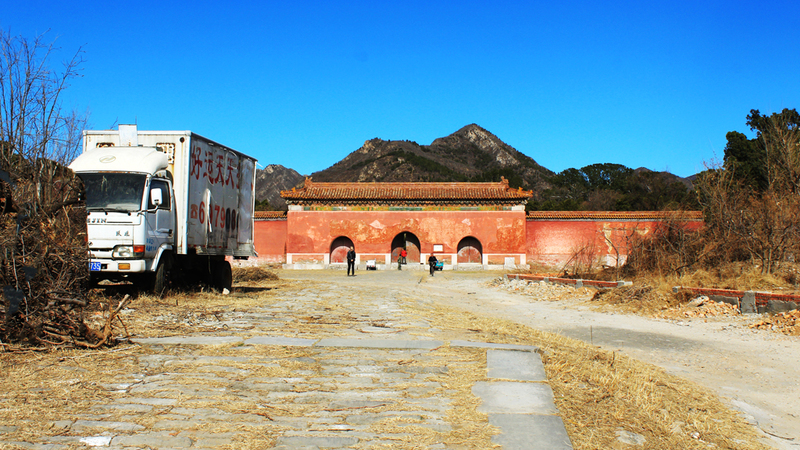 Sixteen photos from a fun ramble through the Huairou hills that passed by abandoned villages, wildcat mines, and one of the Ming Tombs. Thirty-four photos from a long hike over the hills and in to the Ming Tombs area. 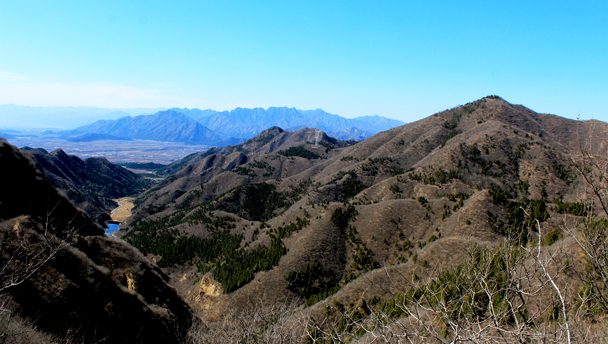 This 14km hike took us past different types of scenery, from the steep, rocky peaks which overlook the Silver Pagodas to the more gently rolling hills in the vicinity of the Ming dynasty tombs. We were fortunate enough to have an clear day, which allowed us to fully appreciate all of the views near and far. Click through for photos and more!